The appearance of the above film on the BFI’s YouTube site has inspired me to revive the Lost and Found strand on this blog (film collections once lost that have now been recovered), and to tell you something of the remarkable story of the Henville collection. Cast your minds back to 1995. It was the year of the Oklahoma City bombing, Yitzhak Rabin was assassinated, the Aum Shinrikyo cult relased sarin gas on the Tokyo underground, Jacques Chirac became president of France, Eric Cantona attacked a football fan in the crowd, a new moving image format, the DVD, was announced, and in film archives and cinematheques across the globe those dedicated to film history and numerology sought various ways to mark the centenary of cinema. The collection had come from one Ray Henville, a collector of vintage radios. At an auction he picked up some vintage radios and with them acquired some cans of unidentified films. Henville knew nothing of old film, but one of them featured a sailing boat, so he sent in a photograph to a yachting magazine in the hope that someone might be able to identify it. Happily the photograph was seen by Bill Barnes, film historian and twin brother of John Barnes, author of the esteemed The Beginnings of the Cinema in England series. Bill alerted that BFI, we took them in, and I ended up trying to identify them. This was a slow process, not least on account of the fragility of the films which meant that for a long period I only had frame stills to go on. But it soon became clear that here was a remarkable collection of films from the 1890s, several of them likely to have been taken by Birt Acres, the first person to take a 35mm cinematograph film in Britain. What distinguished these Acres films was an indistinct frameline and a lack of sharpness to the image. 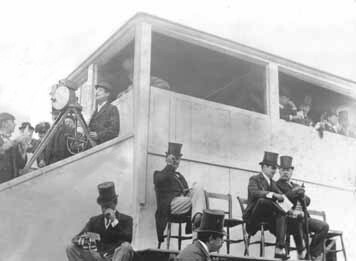 These were characteristics of the Derby film, and the more I looked at it the more I felt that it could be the Derby of 1895, which would make it an extraordinary coup in the centenary year. But how to identity it for certain? There were no contemporary frame stills that I could use to compare, but the angle of the camera matched the position known to have been taken by Acres in the above photograph. Then, having checked race reports and horse racing sources, I looked at the colours of the jockeys (albeit in black-and-white), which matched the winner for 1895, and the fact that it showed a close finish between three horses, such as featured in 1895 but not any other Derby 1896-1900. It wasn’t quite a eureka moment, and there were arguments against the identification. 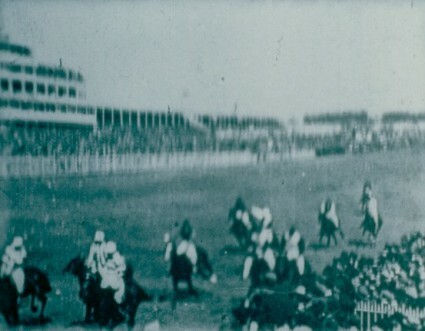 The film had perforations which suggested it was a later production by Acres’ great rival Robert Paul, who was effectively the producer of the 1895 Derby (it turned out to be a reprint), and once a dupe print had been painstakingly created by archivist João Oliveira and we could screen it, we discovered the film ran satisfactorily at 24 fps, when a film shot for the Kinetoscope peepshow (which was the case with the 1895 Derby) ought to have run at 40 fps. There isn’t space here to go into the complexities of this particular argument – suffice to say that one should judge things by what one finds, not what one expects to find, and that though some doubts were raised over the film’s identity I believe I was right, and the discovery recently of further Acres films from this period which similarly run at a speed seemingly too slow for the Kinetoscope tends to verify the original identification. I remember the Yarmouth film in particular because David Cleveland, then head of the East Anglian Film Archive had asked me what the likelihood was of this, the earliest film taken his region, ever turning up. I said it was next to impossible. A few weeks later, we had a copy. Now it’s on YouTube. But what is also of interest is what happened next. A huge fuss made was made about the collection, especially the Derby film. The BFI went to town on it. We had reams of press coverage, television news reports, even a mention on Barry Norman’s Film 95. But this in turn raised the interest of the donor, who felt that there had to be great commercial value in these films, and eventually he took back the nitrate originals, with the BFI retaining the dupe copies it had made. The films were put up for auction in Germany, where I think one or two titles were sold (including the Georges Méliès dramatisation of a scene from the Greco-Turkish War, La Prise de Tournavos, I think), and then the remainder went up for auction at Sotheby’s in 2000. As I recall, the collection was bought by a London antiquarian bookdealer apparently without any knowledge of film. And then what? A mystery. Perhaps the films lie crumbling on that same bookseller’s shelves, or maybe they have passed on to other hands, convinced that the great excitement generated by the films’ discovery had to mean that they had a great commercial value. Of course, they did not, except what one might get for them at auction – in all other respects, there was nothing to be made from them. This is a folly which has been repeated again and again, dreaming of treasures when all one is left with is unshowable, inflammable and not even necessarily unique (at least six of the Henville films were duplicated in other collections), fascinating to the specialist but of only passing interest to the general viewer. And arguably of minimal aesthetic interest.